I think a lot about what I eat. As a vegetarian that works at a food bank, I spend a lot of time thinking about food: What’s in it, the nutritional value, and of course how we can get it to folks in need. But this week my thoughts shifted as my diet took a harsh turn. 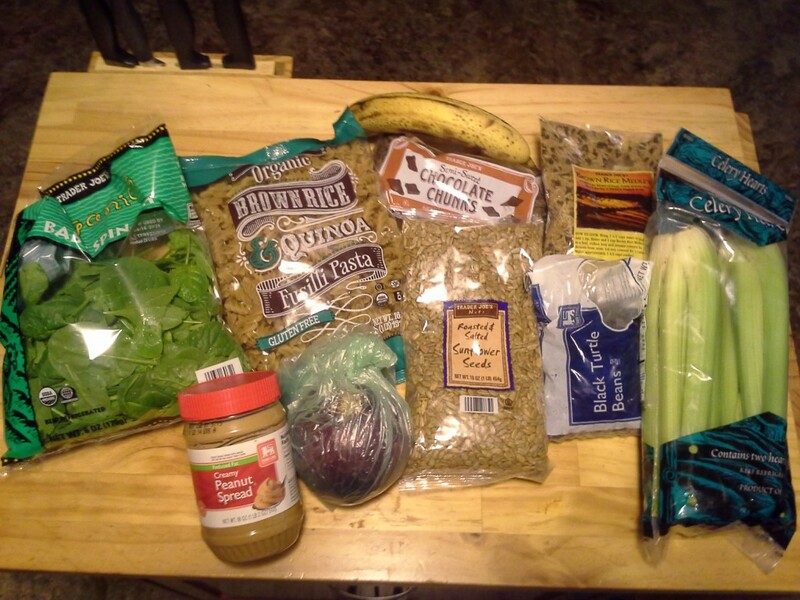 Buy the most protein-packed items at the lowest cost I could find. Keep my meals as healthy and fresh as possible, meaning no canned items in order to avoid high sodium, high processed, and high preservative food. Include some sort of sweet or dessert in my budget. Drink more water to help curb my appetite. I also wanted to try to stick to my normal diet as close as possible, hopefully helping to alleviate some of the stress of such a big lifestyle change. So I shopped at Trader Joe’s like I often do since it is on my way home from work. As a vegetarian, I rely on nuts, beans, and dairy products to provide protein, calcium, iron, and a host of other necessary nutrients. I knew that my usual dairy purchases would be a no-go this week. As a result, I had to lean even harder on beans and nuts to maintain good sources of nutrition and energy throughout the week. I was in Trader Joe’s for roughly 30 minutes deciding what to buy. I usually buy pre-packed bags of mixed nuts for almost $7, a price that suddenly seemed outrageous for just a snack. So I substituted sunflower seeds ($2), a small bag of almonds ($2), and a bag of chocolate chunks ($1.50). I thought the seeds and nuts would serve not only as filling snacks, but would also pair well with a salad or other meals. The chocolate, well, that was just for me. I applaud anyone who can go a week without any sweets, but I simply choose not to. Besides, I figured that the $1.50 would be a good investment for my overall mood, a nice familiar pick-me-up for later on in the week. The amount of sunflower seeds, almonds, and chocolate that I bought would normally actually last me roughly two weeks’ worth of meals, but we’ll see how much more of them I end up eating to replace the missing snacks. I figured the celery and onion could be used in a black bean and rice dish, the onion and spinach could be used with the quinoa brown rice pasta, and all four could be combined to create a salad. The salad of course will have to forgo dressing as it was too pricey to purchase already bottled. For a moment I did consider making dressing from scratch, but I didn’t have enough money left over for oil and/or vinegar. I also felt intimated at the thought of trying to make it for the first time, and worried about making a mistake on a new recipe. I’m quickly learning that on such a tight budget, everything I buy has so much more value to it, and I don’t want to waste a single bit. I also had roughly 1/3 of a peanut butter jar at home (valued at $1.00) and attributed an additional $1.00 to pepper, garlic salt, and olive oil. Those are the only three spices I will use this week, and I will be extremely frugal with their usage. But because I can’t afford other flavorful add-ins such as cheese, spices will play a big part in making my meals as tasty as can be. I feel pretty good about my plan except for the decreased amount of fruits and vegetables. I normally eat plenty of fruit and vegetables every day, so having to choose just four vegetables and one fruit was tough, and I’m sure my body will feel the result of this adjustment. It’s now Day 2 of the Challenge, and things have been going alright. I feel quite proud of the low-budget trail mix I put together, and I feel satisfied with my protein intake. However, I do feel apprehensive about the lack of variety in my meals, afraid that I’ll grow tired of eating the same, plain dish, and I feel worried, afraid that I didn’t make the right choices in my meal plan, afraid that I might run out. Caitlin is one of over 30 Food Bank staff and community members that are taking the FNS Challenge this week to get a sense of what life is like for thousands of people in North Carolina that receive FNS benefits and live on just $4.06 worth of food each day. To learn more or to take the Challenge yourself, please visit our website. Also be sure to follow the meals and experiences of Challenge participants on Twitter using #406ADay. What Would You Do if There Just Wasn’t Enough?